When we started this kitchen reno about a year ago, we wanted a nice clean looking kitchen that could be the backdrop for pops of color coming from accent pieces. As a result, we've stuck with very neutral choices and the only place right now that has a non neutral color is the backsplash with the accent of a soft sea green tile. We love the look of our neutral kitchen and we are really loving how the ceiling beams are coming together but as soon as they were primed we knew that we couldn't leave them in a neutral on neutral state... the beams just disappeared too much. 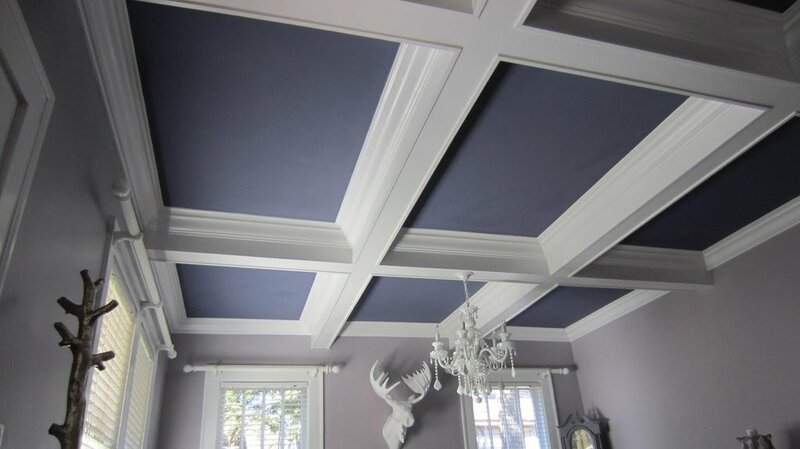 We had talked about adding color to the ceiling a couple of times and after seeing everything primed, we immediately knew that we were going to be picking out more paint and it definitely wasn't going to be neutral. So are you intrigued? Do you want to see a sneak peak? 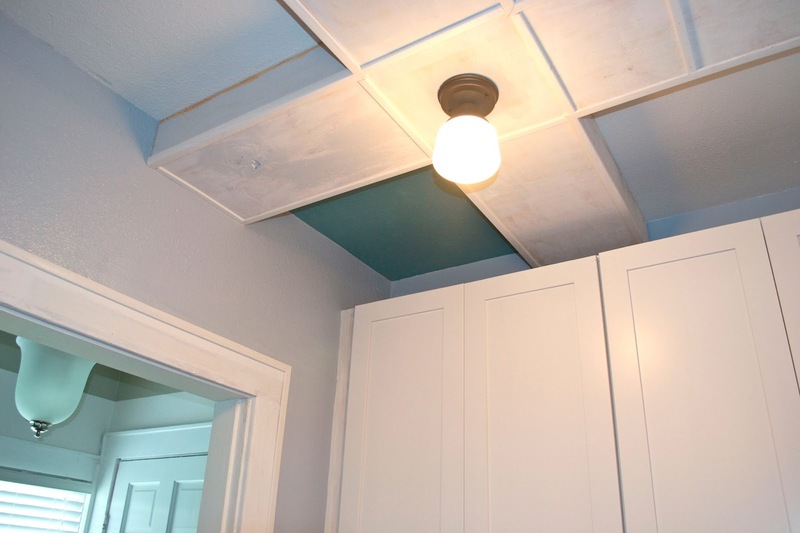 Ok then, you get to see what I've had time to paint... the smallest rectangle on the ceiling... but I sure am loving it! While the color isn't neutral, it does go with the backsplash and with a lot of other colors. Also, since it's on the ceiling it gives a punch of color in the room without being in your face. We're really excited to see what it looks like when it's all done. I love it! I think it is going to look great. I can't remember now, why you chose to intall this ceiling...just because? or was it a great cover for an already bad ceiling? I ask that...because it would be the case with me. My kitchen ceiling is a big expanse...and imperfect in many ways. This would totally work. I have to go read some more on this. Y'all are doing a great job...especially with the new baby too! Thanks! We ended up doing the beams because we wanted to add some architectural detail to the room and it was a great way to run electrical for the new lights instead of ripping apart the ceiling. You can read more about it here http://www.ckandnate.com/2013/01/lights-beams-ceiling.html.